Eega is the best film in Rajamouli’s career. Rajamouli has taken Telugu cinema to national level with his concept of Eega. Keeravani’s background music pumps oxygen into the movie. There are two complete songs in the movie. Both of them are shot superbly. The graphics in earlier big films were in the background of main leads. Here Eega is the main lead. Hence creating Eega and animating it without looking funny is awesome. Nani is extremely lovable and makes a deep impact with casual looking yet intense performance. Sudeep has taken the movie to next level with his fervent expressions and violent body language. Samantha’s run of success continues as she did extremely well as a bereaved lover. Nani(Nani) lives opposite the house of Bindu (Samantha) and he is madly in love with her. Bindu is a miniature artist and a social worker who runs an NGO. She too loves him, but never expresses it to Nani and prefers to keep him guessing. As time goes by, Sudeep (Sudeep) comes into Bindu’s life as a very rich benefactor of Bindu’s NGO and he starts coveting her. Sudeep is a cruel guy by nature and he does not hesitate to kill. When he comes to know of Nani’s love for Bindu, he brutally kills off Nani. 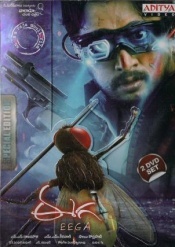 A dying Nani comes to know that Bindu too loves him and this strong love for Bindu causes him to be reborn as an Eega. The rest of the story is about how the Eega conveys who he is to Bindu and about how they take revenge on Sudeep together.